Closed Variable Wheel Attenuator 990-0704 is used when photodetectors with high sensitivity (e.g. CCD, photomultiplier, etc.) are used and it is necessary to eliminate the side background lighting fully. You may order standard connecting adapters 990-0000-01 and 990-0000-02 separately. Custom adapters are available too. 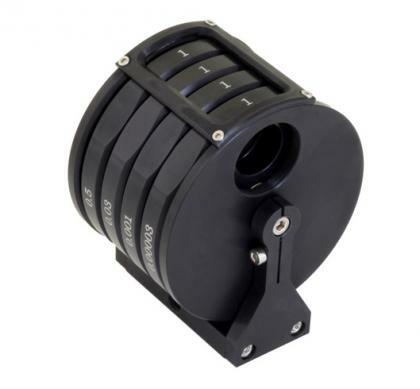 Loosen the central axis and rotate the whole body of the filter to set the desired position of an optical axis at a height between 36–71 mm. The base of the attenuator has M6 holes on 3 sides for mounting versatility.